The River Tone is a river in the English county of Somerset. The river is about 33 kilometres (21 mi) long. An act of Parliament granted in 1699 authorised work that made the river navigable as far as Taunton. The act specified that profits should be used to benefit the poor of Taunton, but the Proprietors succeeded in avoiding their obligation until 1843, when they used the proceeds from the sale of the navigation to fund a wing of the Taunton and Somerset Hospital, and to aid the Taunton Market Trust. Taunton, is the county town of Somerset, England. The town has over 1,000 years of religious and military history, including a monastery dating back to the 10th century and Taunton Castle, which has origins in the Anglo Saxon period and was later the site of a priory. Name Atapattu would make you remember the man who made 5502 test runs in 90 tests and 8529 runs in 268 Onedayers. He debuted at Chandigarh in Nov 90; failed to open account in both the innings, waited for almost 2 years played against Australia at Colombo – made 0 & 1; then after close to another 2 years played at Ahmedabad making another pair. This woman is different – She is : Atapattumudiyanselage Chamari Jayangani, no relative of Maravan Atapattu, who played in ICL too. Indian Men’s team came to the Caribbean after yielding their Champions Trophy crown but they haven't taken long to find their happy place again. They scored 300-plus in less than 50 overs in their first completed match since the defeat to Pakistan, bringing the cricket world back to the status quo. Some of us are not following the Series … .. .. but not the Women’s WC at UK. At Bristol, Australia 262 for 2 (Lanning 152*, Bolton 60, Perry 45*) beat Sri Lanka 257 for 9 (Atapattu 178*, Bolton 2-18) by eight wickets This was a mismatch on paper. Sri Lanka were ranked eighth. They had never beaten Australia, the defending champions, in eight previous meetings. Chamari Atapattu, however, showed cricket isn't played on paper, but out on the field. By smashing the third-highest score in women's ODIs - an unbeaten 178, two more than Sri Lanka's previous highest of 176 against Australia - she gave them more than a shout of pulling off a mighty upset with a score of 257 for 9. But, as was the case against New Zealand, poor fielding and catching let them down, and the defending champions broke open the deadlock and Lanning’s unbeaten 152 took Aussies to an eight-wicket win in Bristol. In an earlier match, Natalie Sciver converted her maiden ODI century into a blistering innings of 137 from 92 balls, and Heather Knight, the captain, also passed three figures for the first time in limited-overs cricket, as England dusted themselves down after their opening-match defeat against India to rack up a formidable total of 377 for 7, and a commanding if rain-interrupted 107-run victory over Pakistan at Grace Road. England's total was their highest in a World Cup match, and second only to Australia's tournament record of 412 for 3 against Denmark in 1997. But it didn't seem entirely on the cards during a cagey first ten overs, in which England lost both of their openers, Sarah Taylor and Tammy Beaumont, to the erratic but occasionally penetrative swing bowling of Kainat Imtiaz. At 42 for 2, the hosts still appeared to be suffering from a certain degree of stage fright. In the 7th match of the tournament at Taunton, WI made 183/8, strangled by Indian spin. Indians chased it rather easily winning by 7 wickets (with 45 balls remaining). Opener PG Raut was out for a duck. 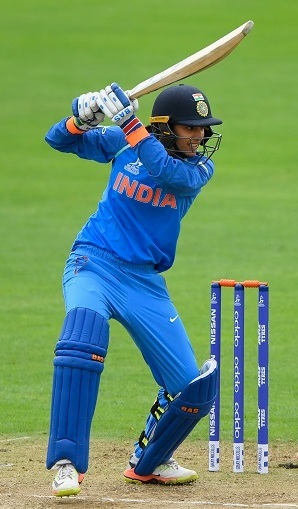 Smriti Mandhana continued her fine form making an unbeaten 106 off 108 balls. Mithali Raj made 46.